City councillors got their first look Thursday at the details of a $3-million plan to convert a former campground into a sports complex at Confederation Beach Park. The complex will be one phase of a long-term $40-million master plan to enhance the under-utilized beachfront land — one that is envisioned to eventually include a central commercial village, improved trails and boardwalks, public art and other infrastructure improvements. Construction is set to start next year on the sports complex — but if you're thinking basketball courts and football fields, think again; the plans include a seniors' cricket pitch and pickle ball courts. "Pickle ball appeals to a broad range of ages," Lawrence Stasiuk, supervisor of the city's landscape architectural services, boasted in his presentation of the report to the public works committee Thursday, which included illustrated maps of the planned development. Coun. Lloyd Ferguson asked if it would be possible to consider double-painting the courts so that they can also be used for the more familiar sport of tennis. Stasiuk said he would consult the design department. Overall, councillors expressed excitement about the plan. 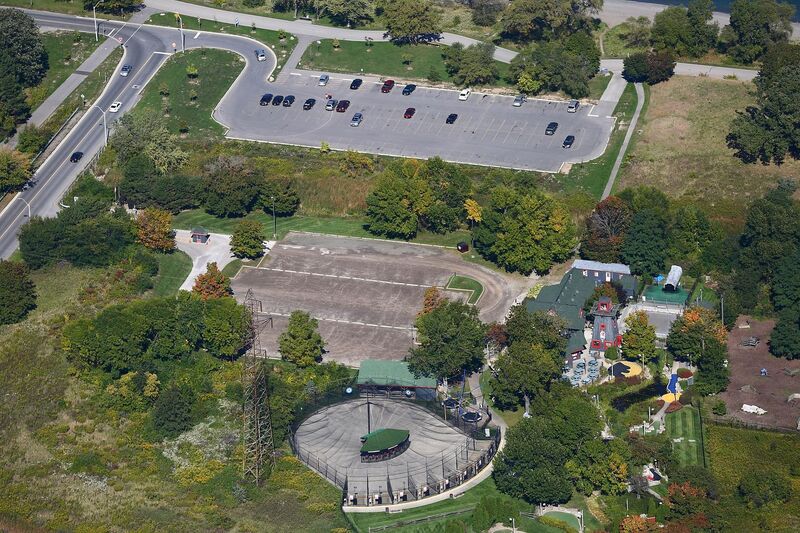 A 2013 consultants' feasibility study of the redevelopment plan said that, in its current state, the park — which is owned by the city but managed by the Hamilton Conservation Authority — "is a lost opportunity in that existing infrastructure does not function to its full potential to attract visitors to the park, or to generate sales in the park's commercial establishments." On Thursday, Coun. Tom Jackson called the area a "jewel" and a "tremendous asset," and said he fully supports the proposed investment to boost its potential. "Many of our citizens don't have the wherewithal to go to Muskoka … this is exactly, in my humble opinion, where the municipal tax dollar gets the greatest bang for its buck." Coun. Chad Collins — whose ward includes much of the park — praised staff for their work, but questioned the planned location for the "central village," which is set back from the beach. Collins expressed concern that private restaurateurs or other potential vendors will "want to see the water, the trails. Where this central village is located just doesn't make a lot of sense." Stasiuk agreed this is something that can be looked at down the road. Collins also highlighted the importance of factoring Wild Waterworks into the long-term plans. There were 130,000 visitors to the water park last year, with more than 100,000 so far this year, which is on track to be a record, Stasiuk noted. 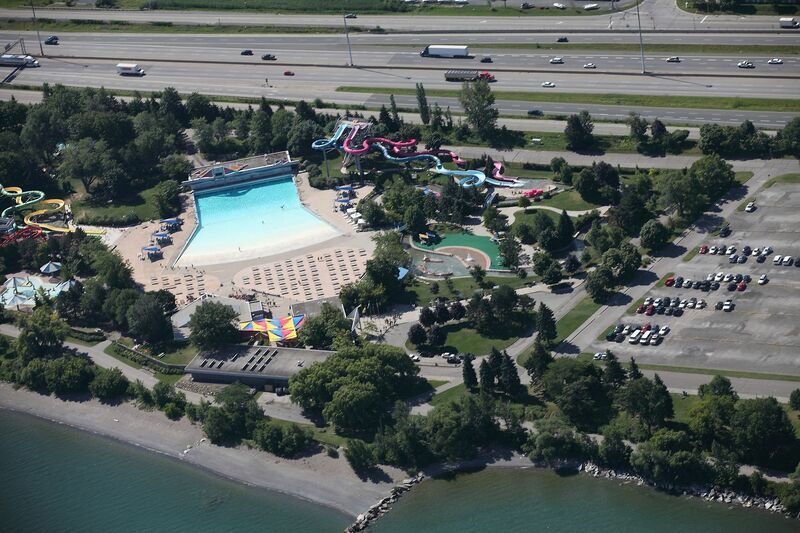 While $150,000 has been earmarked for a master plan study of the aging water park next year, none of the $40.76 million has been allocated to actually updating the park's infrastructure. "Wild Waterworks is an old, aging facility … many of the components there are original to the park, and that is going to come with a price tag," Collins said. "I want to make sure that's not lost in this whole conversation about what's happening at the park, because as you mention, the $40 million … the water park seems to have been over the years, forgotten." 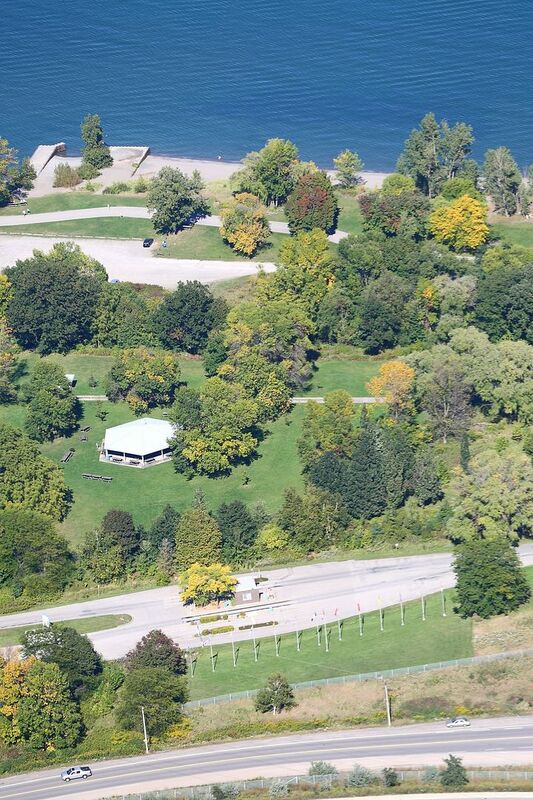 The Confederation Beach Park strategy to create a sports facility for the public scored with Hamilton politicians. The first phase of what is a $40.7million in public funding in an implementation strategy over the next 20 years for the 93-hectare park involves $3 million to be spent next year creating a regulation cricket pitch, 12 pickleball courts, parking lot, administrative building, and washrooms. The preliminary cost for the sports complex, which also includes a natural area, and soccer fields, is about $7 million, according to the Confederation Park Master Plan Review that was completed in 2011. He said sports groups, especially Hamilton cricket clubs, have been “anxious” to have the new pitch built at Confederation Beach Park. Collins said later the land where the former camp ground and where the sports complex will be located, has to be cleared of trees, and the infrastructure – hydro and servicing lines – need to be removed. Other short-term projects under the Confederation Beach Park implementation strategy include spending $150,000 in a study to determine the future of the Wild Waterworks, relocating the current entrance of Confederation Beach Park to the North Service Road entrance and creating a “little squirt works” water play area for young users. Collins said the Ministry of Transportation has been reviewing the traffic impacts of relocating the entrance of the park, but no answer has been received from the province yet. The Ministry is looking at the impact of traffic along the North Service Road, which can be an issue when the Queen Elizabeth Way is backed up due to traffic congestion. More long-term ideas for Confederation Beach Park include $40 million in private investment concentrated in what consultants have called the Central Village –estimated to cost up to $10 million - with the idea of attracting businesses to establish restaurants or attractions that could be intertwined with the public investment projects. Collins said the private investment is essential to help pay for improved services, such as water, sewers and other infrastructure. The city is currently looking at trying to find the $9.1 million for infrastructure upgrades. An economic feasibility study found that Confederation Beach Park is an “undeveloped” asset, but it is “aging” and needs capital investment. Lawrence Stasiuk, of the city’s landscape architectural services, said Wild Waterworks, needs to be updated for future use. The $40.7 million for redeveloping Confederation Beach Park does not included any costs associated for renovating Wild Waterworks, which is projected to break an attendance record this year, he said. Last year the city completed 800 metres of a new 800-metre-trail around Stoney Creek Pond on the former campground after nearly a year of work. The trail connects to the main Lake Ontario Trail system. In addition, councillors approved the new name for Confederation Park; introduced this January a new logo, which has a large light blue ‘C’, a lighthouse inside of it and wave at the bottom; new play equipment was installed at Beaches Grill in June; new signage is scheduled to be installed this fall, and secondary gate features will be constructed, also this fall. Mountain councillor Tom Jackson said the vision for Confederation Beach Park is “exciting.” The only issue is the “unsightly” hydro lines that should be removed or relocated. Collins said discussions have taken place about the 20-plus hydro towers along the property, but it will cost money to eliminate them. The overall goal of the master plan, says Collins, is to create a year-round, multi-use facility within Confederation Beach Park. Other ideas for the park include creating winter activities such as ice skating. In a country where hockey is king, and increasingly the main summertime youth sport activity is soccer, it’s easy to overlook the growing popularity of cricket in Canada. But in cities like Hamilton with large populations of arrivals from cricket hotbeds like India and Pakistan cricket is on the rise. In fact the sporting website Sportyghost ranks Cricket as number seven in popularity in Canada—ahead of Curling, tennis and golf. Currently there are about 450 schools playing cricket in the GTA and Hamilton. Burlington has a permanent cricket field at Central Park .Since 2008 Canada has hosted a number of cricket matches involving international cricket teams from India, West Indies, Pakistan, Sri Lanka and Zimbabwe. Little wonder then that the city is planning to construct a full sized cricket pitch as part of the redevelopment of Confederation Beach Park. Lawrence Stasiuk Supervisor Park Redevelopment Landscape, says Hamilton has been making do with small cricket pitches, that are only half the regulation size; but now there will be a full sized facility located at the eastern end of the park where there was a campground up until a few years ago. The cricket field will form part of a multi-use sports park that will also include 12 pickleball courts and a general use playing field that could accommodate soccer. Later phases of the development will see construction of a field house with showers and a change room. The old campsite gatehouse will be converted to public restrooms. The initial phase of the project will cost $3 Million and be finished in 2019. The sports field development is part of a much larger $40 Million, 20-plus year master plan for the redevelopment of the entire four kilometer- long Confederation park. City officials say a ball has been thrown for the new sports complex at Confederation Beach Park. Landscape architectural services supervisor Lawrence Stasiuk said bidding is underway for the first phase of construction for the project. “The tender was released on March 14 and will close on April 5,” he said. The city is building the sports facility at the east end of the park on the former campground site. The first stage will include the construction of a regulation-sized cricket field, multi-purpose field, 12 pickleball courts, a driveway and half of a planned parking lot. The approximate cost of the work is $3.5 million. Stasiuk said he believes the tender will be awarded quickly. The hope is to get the successful contractor on site by the end of April, he said. To make way for the sports park, the central building on the old campground site was demolished in 2017. Hydro and servicing lines were also removed. Some trees were cleared as well. Stasiuk said the city is sorting out the details for the second phase. It’s an “expensive phase” and includes the construction of a new field house and parks maintenance building and yard, as well as the renovation of an existing gatehouse, he said. Stasiuk said it also involves the development of a natural-themed play area, the rest of the slotted parking lot and additional trails and walkways. The sports complex is part of a long-term, more than $40-million master plan to enhance the underutilized 93-hectare beachfront land. The hope is to eventually include a central commercial village, improved trails and boardwalks, more trees, public art and other infrastructure improvements. Ward 5 Coun. Chad Collins could not be reached for comments by press deadline. 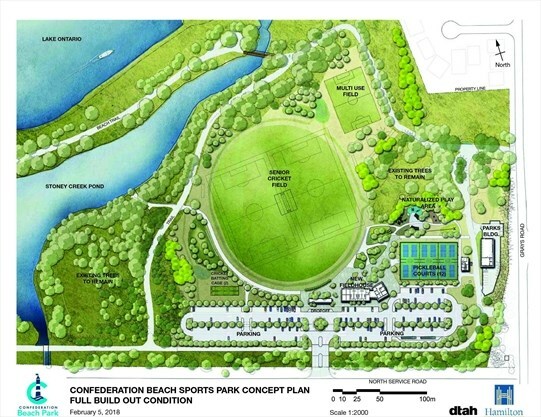 He has called the sports facility “exciting” in the past and said sports groups, especially Hamilton cricket clubs, have been “anxious” to have the new pitch built at Confederation Beach Park. Laura Lennie is a Reporter for Stoney Creek News. She can be reached at llennie@hamiltonnews.com.